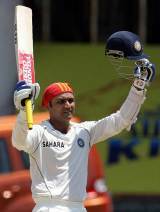 Sehwag remained unbeaten on a magnificent 309 (n.o) as records tumbled on the third day of the first test match between India and South Africa in Chennai. This was Sehwag’s second triple hundred making him only the third in the history of test cricket after the legendary Sir. Don Bradman and Brian Lara. Sehwag also became the fastest to the landmark scoring the runs in only 278 deliveries. South African bowlers toiled hard on a flat pitch and the rate at which the Indian innings has progressed would have given the coach and captain Greame Smith a lot to think about. SA would be hoping to dismiss Sehwag quickly on the fourth day to get the RR down which is more than 4 runs per over for the Indians. The Indians would be hoping to go ahead by 200 runs by tea and put pressure on the SA batsmen later in the day. Sehwag’s innings was punctuated with 47 hits to the fence which include 5 sixes. This is his second consicutive ton after his match saving hundred against Australia in Adelaide. All in all it was great day for the Indian team and for the first time it seems like there can be a result in this test match. Much will depend now on the rest of the Indian batting and the spin duo of Anil and Bajji, when SA start their second innings. India are just 72 runs behind with two days to go and 9 wickets in hand. Day 4 promises an exciting day of cricket. But for now lets celebrate one of the finest innings played by an Indian cricketer.